This guide will take you through the top pieces of information to help you prepare for partnership taxes, including types of partnerships and how they are taxed, when and where to file, which form to use, and estimating partnership taxes. Before you enlist the help of a CPA, Enrolled Agent, or another qualified tax preparer to prepare your partnership's taxes, there is some basic information about partnership taxes you should know. Read more about Getting Help with Business Taxes. What's New With Partnership income Taxes? The due date for income taxes for partnerships and multiple-member LLC's taxed as partnerships is March 15. If March 15 falls on a weekend or holiday, the return is due the next business day. Check this article about business tax due dates for the current year to get the exact date. This partnership return information is also for multiple-member LLC's, which file their business tax returns as partnerships. A possible 20 percent deduction on your net income, in addition to other normal business deductions. This new deduction has many limits and qualifications. Increased write-offs for depreciating business assets like equipment and vehicles. Elimination of entertainment expense deductions. Meal expense deductions are still available, most at 50%, but some meal expenses may not be allowed. Deduction of commuter benefits for employees is no longer available. Some business tax credits have been cut, including the Work Opportunity Tax Credit. This article on the benefits and drawbacks of the Trump Tax Cuts gives more information. 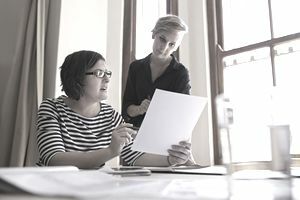 The information provided in this tax guide is also applicable to multiple-member limited liability companies, which are taxed as partnerships for federal income tax purposes. Read more about how LLCs pay income taxes. Several different types of partnerships may be formed, depending on the preferences of the partners. A partnership can be formed as a general partnership, with all partners participating in the management, or it may have limited partners. A limited liability partnership may also be formed. All partnership types file federal income tax using the forms described below; how the individual partners are taxed depends on the type of partnership and the specific details of the partnership agreement. Read more about types of partnerships. Partnerships file their federal income tax returns using Form 1065. Form 1065 is an information return, meaning that no tax is imposed directly on the partnership based on information in Form 1065. The partnership must also prepare a Schedule K-1 to give to each partner, showing that partner's distribution of the taxable profits or losses of the partnership for that year. The Schedule K-1 is filed with the individual partner's personal income tax return for the year, and the total from the Schedule K-1 is recorded in Line 12 - Business Income. Individual partners pay income taxes on their share of the profits for the partnership. The partners must also pay self-employment tax (Social Security/Medicare) based on their share of profits, each year. To file your partnership income taxes, you will need to provide some financial reports and other documents to your tax preparer. These documents include a balance sheet for the beginning of the partnership's fiscal year and the end of that year, a profit and loss statement for the end of the year, information to calculate cost of goods sold and other documents. Here is a list of the documents needed to prepare a partnership income tax return. You can file your partnership tax return on Form 1065 by mail or you can have your tax preparer e-file the return. If you are filing by mail, the address for sending in your federal tax return for a partnership depends on your state. See page 4 of instructions for Form 1065 for the mailing address for your state. To file an application to extend your partnership tax return, you must use Form 7004. This form must be filed by March 15, and taxes (estimated) must be paid by that date. You have six months to file the return, which is due September 15. If you file an extension, you must still pay the income tax by the original due date; payment is not extended. To file an amended partnership return, make a copy of the partnership return Form 1065 and check box G(5) on page 1. Attach a statement with details on what is being changed. If the Schedule K-1 (partner or LLC member statement) is incorrect, check the "Amended K-1" box on the top of the Schedule K-1 to indicate that it has been amended. Partners must pay income taxes on their distribution of profit in a partnership in the state or states where the partnership is located. Partnership taxes are paid on the individual partner's personal state tax returns. if you and your spouse are the sole owners of a partnership (not an LLC), you may be able to elect qualified joint venture status and file two Schedule C forms instead of filing the partnership tax form. You don't need to file an election to do this, but you must meet certain specific qualifications. Both members must materially participate, there must be no other owners, and you must file a joint tax return. Read more about how the Qualified Joint Venture works. The IRS web page titled Partnerships includes a description of the taxes paid by partnership businesses and the individual partners. It's worth a look if you are confused.